3. Nonfunctioning benign lesions that are either symptomatic or have the potential to become symptomatic. 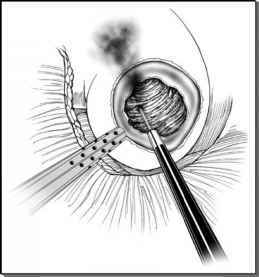 The resection of aldosteronomas was one of the initial indications for laparoscopic adrenalectomy. These lesions are often small and the patient's body habitus favorable; therefore, they are particularly suited to the laparoscopic approach. Aldosteronomas may be considered as lesions of choice for surgeons early in the operative learning curve (2l). Unilateral laparoscopic adrenalectomy is the treatment of choice for patients with Cushing's syndrome due to unilateral adrenal adenomas (22). The preponderance of periadrenal fat in Cushing's syndrome cases may make adrenalectomy initially more difficult, particularly via retroperitoneal approaches (21,23). Cushing's disease refractory to primary pituitary treatment or cases of ectopic adreno corticotrophic hormone-dependent Cushing's syndrome where the ectopic source of adreno corticotrophic hormone production cannot be localized may require bilateral adrenalectomy (24). Bilateral laparoscopic adrenalectomy has also been proposed as an alternative treatment for select cases of congenital adrenal hyperplasia (25). Subclinical Cushing's syndrome is present in up to 20% of cortical adenomas (26). It is characterized by loss of the normal cortisol circadian rhythm and resists suppression with dexamethasone, but may have normal 24-hour urinary cortisol levels (26,27). Such lesions may progress to clinical Cushing's syndrome or present with postoperative adrenal crises from unrecognized suppression and may therefore be better removed rather than monitored (24). After initial controversy, laparoscopic adrenalectomy for pheochromocytoma is now well accepted as a standard indication for unilateral or bilateral disease (24,28-30). Laparoscopic adrenalectomy for pheochromocytoma produces similar or milder hemodynamic effects, less surgical trauma, and is superior in terms of convalescence when compared to open surgery (28). The quintessential objective during laparoscopic adrenalectomy is early control of the adrenal vein, and in this regard, pheochromocytomas are best suited to the transperitoneal approach (31). Adrenal carcinomas are larger than 6 cm in size in 92% of cases; however, because computed tomography scanning can underestimate the true size of a lesion, a limit of 5 cm has been used empirically. Masses demonstrating local organ invasion or venous tumor thrombus are not suitable for laparoscopic resection, because the ability to achieve an adequate en-bloc resection is extremely difficult in this setting. Hand-assisted techniques, however, may overcome this. The posterior retroperitoneal approach has also been utilized because it also allows early access to the adrenal vein, particularly for right-sided pathology (28). Laparoscopic management of possible adrenal malignancy has been an area of controversy. Firstly, size criteria for the removal of nonfunctioning incidental adrenal masses continue to evolve, and secondly, debate exists as to whether it is appropriate to manage potentially malignant adrenal lesions laparoscopically. Adrenal carcinomas are larger than 6 cm in size in 92% of cases; however, because computed tomography scanning can underestimate the true size of a lesion, a limit of 5 cm has been used empirically (32-34). Other factors that require consideration include the patient's age and comorbidities, and the burden associated with ongoing monitoring of the lesion. Older patients are more likely to have nonfunctioning adenomas, whereas younger patients may require serial imaging for many years (24). The management of 3 to 6 cm nonfunction-ing adrenal masses is controversial, but laparoscopic adrenalectomy is recommended if the lesion has suspicious features on imaging, demonstrates growth on serial imaging, or if the patient is young and fit (24). Another matter of debate is the oncological safety of laparoscopic adrenalectomy for primary adrenocortical carcinoma and metastatic disease. Opinion varies from absolute contraindication (35-37) to acceptance as a form of treatment for large, potentially malignant lesions up to 15 cm in diameter, provided that the lesion is not locally invasive (38,39). Sung and Gill recommend open adrenalectomy if the mass is larger than 10 cm in size, is locally invasive, or has tumor thrombus (6). Smaller, discrete, solitary metastases or primary carcinomas may, however, be suitable for laparoscopic resection (6). Although successful laparoscopic management of primary and metastatic adrenal masses has been reported (38-40), case reports of local recurrence following laparoscopic adrenalectomy for carcinoma have been described (41-44). It is now generally considered reasonable to perform laparoscopic adrenalectomy for organ-confined disease if the tumor is not locally invasive and if the surgeon is experienced (5,39,40). Masses demonstrating local organ invasion or venous tumor thrombus are not suitable for laparoscopic resection, because the ability to achieve an adequate en-bloc resection is extremely difficult in this setting (7,8,34,45). Hand-assisted techniques, however, may overcome this (7,45,46). Benign but nonfunctioning lesions may also require laparoscopic adrenalectomy for control of local symptoms. Myelolipomas larger than 4 cm in size should be considered for resection because of the potential for life-threatening hemorrhage (47). aPerform in second trimester if clinically required. bMay be performed via an alternative approach. Controversial. The upper size limit that may be safely resected is not an absolute, arbitrarily defined number, but rather relates to the surgeon's experience, size of the lesion, patient body habitus, surrounding anatomy, and, because right-sided tumors may be intimately associated with the inferior vena cava, the side of the lesion.